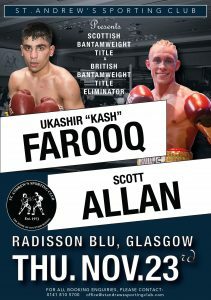 Wishaw’s Scott Allan is aiming to exact revenge on his Scottish Bantamweight counterpart Kash Farooq, on November 23 at the St Andrew’s Sporting Club. The pair clashed in an excellent contest last year, with Farooq coming out the winner over the ten rounds distance. Allan opened up on what had changed since the last contest. The brash North Lanarkshire man said, “Training’s going absolutely amazing, and yes I’m actually training for this one this time! Allan continued as he elaborated on how fatherhood has changed his perception coming into the November 23 clash. 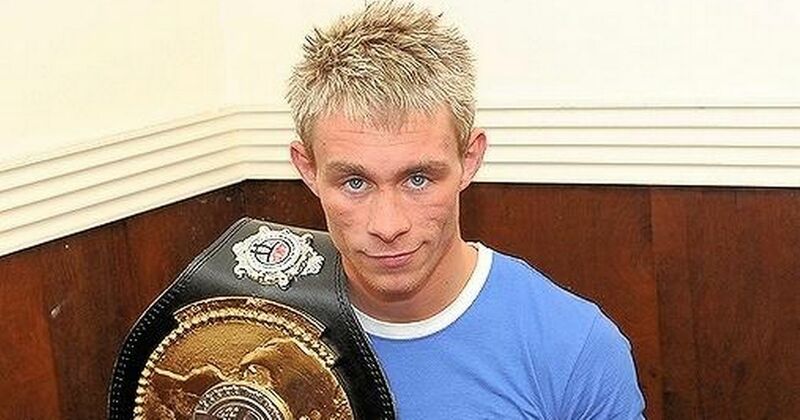 The Scottish Bantamweight Champion said, “Becoming a father is absolutely amazing. It’s a better feeling than any fight I’ve ever won before and it outshines every title I’ve ever won. Allan has bounced back since his defeat to Farooq, recording an impressive decision victory over imported opposition last June. The ‘Title taker’ assessed how the pair had changed in the ring since they last clashed and gave his prediction for the fight. The Motherwell FC supporter stated, “Both of us have come on since our last scrap but me becoming a father will be the biggest change and only for the better! “I’m not fighting for myself anymore it’s all for my little girl what more motivation do you need? None! Anytime my alarm goes off in the morning usually I’d snooze it 3/4 times but not anymore!